April 7, 2015, 3:20 p.m. 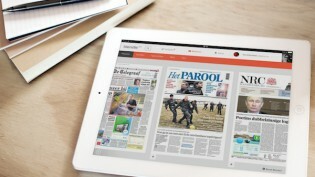 Subscribers to more than 250 newspapers around the globe now have free digital access to the Post. The next question is how the paper will use this network to make money. 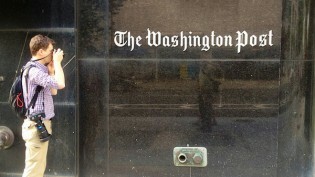 By Justin Ellis @JustinNXT April 7, 2015, 3:20 p.m.
More than 250 newspapers around the globe are now signed up to The Washington Post partner program, meaning that subscribers in places ranging from Chippewa Falls to Tel Aviv can access the D.C. newspaper for free. So far, at least, it looks like a win-win for publishers on both sides of the deal. If you’re The Portland Press Herald or The Toledo Blade, you get an additional benefit to throw at your current subscribers to try to keep them on the vine as long as possible. If you’re the Post, you get free promotion from other newspapers and the potential for more readers coming to you for national and international reporting. That part seems to be going well for the Post: While traffic from partner-paper subscribers are only a small share of overall traffic, the paper reported 48.3 million unique visitors in February, a 63 percent increase over February 2014. But the paper is also rolling up information about its newfound readers. Each subscriber coming from papers in the partner program has to register on washingtonpost.com to get what is essentially a free digital subscription. (The Post paywall already makes exceptions for students, government employees, and others.) If history (or his day job) has taught us anything, it’s that Washington Post owner Jeff Bezos is very interested in using signals from customers to find better ways to deliver products and services. But, at the moment, the Post doesn’t have any designs on that information, or to monetize the partner program by asking newspapers to pay for the service, said Steve Hills, president and general manager of The Washington Post. “We’re playing the long game here, which is getting audience and awareness. And that’s really it,” he said. Still, one could imagine other ways the program could lead to additional revenue. Papers in the partner program are likely candidates for the Post’s paid Sunday supplement. According to the Post, The Dallas Morning News, Newsday, The Cayman Compass, and The Wenatchee World are signed up to offer the weekend tabloid. Similarly, the Post is considering the idea of licensing its proprietary content management system to other newspapers, Hill said. The CMS is currently being tested out in college newspapers. The partners network would make sense as an outlet for the tech, which could also eventually integrate Post stories into another paper’s website. The Post’s strategy, or at least this phase of it, is focused on expansion. The paper signed an agreement with their owner’s other company to get prominent placement — as well as free access — for its new Kindle Fire app. In the past two months, they’ve also reached deals with Flipboard and with pay-what-you-wish service Blendle. Metro and local newspapers are just another platform for expanded reach in that model. The usefulness in this case is being an amped-up wire service for reporting outside a newspaper’s coverage area, at no additional cost to either readers or their local daily. 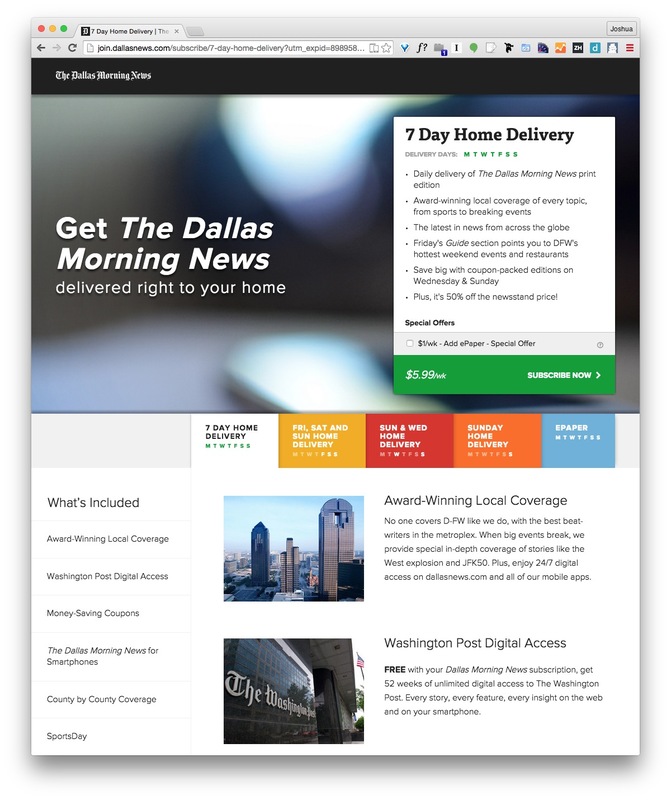 The way it works is readers at partner papers like The Dallas Morning News get an email offer for free digital access to the Post. Following a link, they register at washingtonpost.com and receive free access to the Post. “It feels like one of those chocolate-peanut butter, Reese’s Peanut Butter Cup partnerships,” said Jim Bernard, senior vice president for digital at The Star Tribune in Minneapolis. Bernard said digital access to the Post is an important asset that can push current subscribers into full access of their digital offerings, stop people on the verge of dropping the paper, or lure back lapsed subscribers. When you tell readers they get access to the Post — which they position as a $100 value — it helps keep them around, Bernard said. The relationship with the Post will likely lead to more new revenue for The Star Tribune: Bernard told me the paper has already started offering the Post’s weekend insert, sold at an additional cost to subscribers. For the partner papers, the Post also doesn’t pose much of a threat for overlapping coverage. While The Star Tribune has D.C.-based reporters, their focus is related to Minnesota, not broader politics, policy and national reporting like the Post. “If you live in Minnesota and like the news, The Washington Post will never be a substitute for The Star Tribune,” said Bernard. Or, to put it another way: “The Washington Post just doesn’t cover the Minnesota Vikings,” he said. 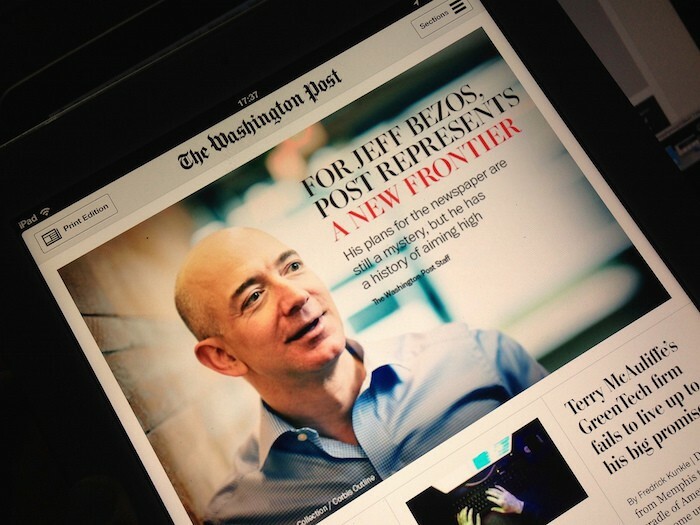 Photo of Washington Post iPad edition in 2013 by Esther Vargas used under a Creative Commons license. POSTED April 7, 2015, 3:20 p.m.
Ellis, Justin. "By building partnerships with other newspapers, The Washington Post is opening up revenue opportunities." Nieman Journalism Lab. Nieman Foundation for Journalism at Harvard, 7 Apr. 2015. Web. 18 Apr. 2019. Ellis, Justin. "By building partnerships with other newspapers, The Washington Post is opening up revenue opportunities." Nieman Journalism Lab. Last modified April 7, 2015. Accessed April 18, 2019. https://www.niemanlab.org/2015/04/congratulations-toledo-blade-reader-on-your-subscription-to-the-washington-post/.